WVI vet and patron Tom Ogilvie Graham operates in the field on pack leader Bulls Eye in Hwange. 2010. [/caption] Sadly, because of the political situation we weren’t able to send a vet out to assess their needs and provide some training and equipment until early 2010. Since then we have been able to make visits at least every 2 years and steadily produced equipment for the clinic. Going through their records, PDC have had 53 individuals going through the clinic, of which all but three went back into the wild (not including Thembile – see below). Reintroducing a pack member back into a group once they have been removed is incredibly difficult, if not impossible, in most species. The removed member loses all their status and comes back at the bottom of the hierarchy. It is a tough life being part of a pack, troop or pride. The animal with the lowest status gets bullied and if already compromised due to sickness or injury this bullying normally has a fatal affect. 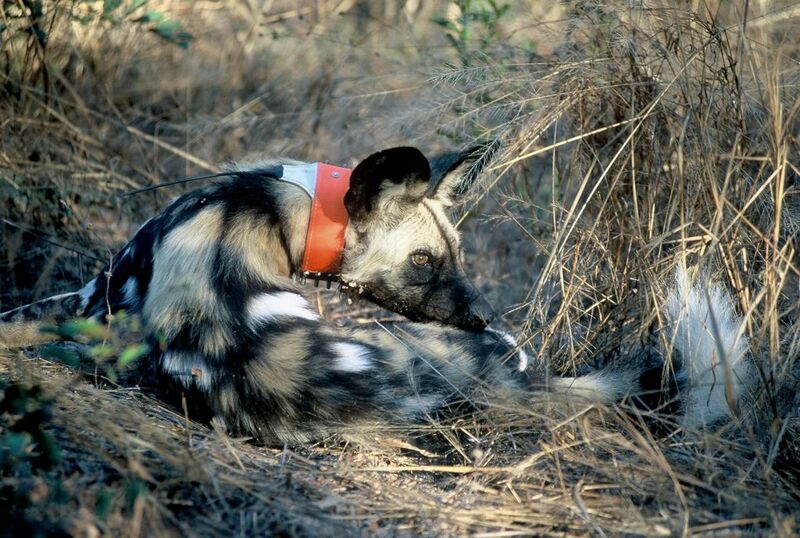 However, African painted dogs have an unusual social structure. They will look after sick or injured pack members, bringing food back to them and waiting for them. Often when PDC find a sick or injured dog that needs a few days of respite in the rehabilitation centre, the pack will hang out near the centre, waiting for them. Other times the dogs in the centre or lone dogs passing through will ‘make friends’ with the injured dog and they can be released together. PDC's best Rehab success story is Vusile. She was an orphan who appeared at the gate, starving. After a brief period of feeding her and integrating her into a pack, she was released back into the wild. She found a mate and eventually had a litter of six pups. They are all still alive and founders of their own functional packs in Hwange National Park. Many of them are grandparents themselves. Thus that single intervention to save the life of a starving orphan has increased the population of painted dogs in Hwange NP by more than 50 and an addition of at least five functional packs. That constitutes a third of the current population estimate for HNP. PDC have recently released one of Vusie’s granddaughters, Fran, who had been held in the centre since late last year. They had been hoping that some dispersing males would pass by and befriend Fran or at least appear in the area, but this didn’t happen so the difficult decision was made to release her on her own. After fitting her with a protective collar, she was let go. Fran has remained close to the rehabilitation centre, clearly indicating that she considers it a safe haven and certainly has no negative perception of it. Staff continue to feed her while she remains nearby until she eventually ventures further and further away to look for new pack mates. Earlier this year three-year-old Thembile, sister to Fran and granddaughter of Vusile, broke her front right leg. It was an awful break just below her “elbow.” It was agonizing watching her limp along and you can imagine the actual pain she was suffering. The PDC team successfully darted her so she could be brought in to the rehabilitation centre for assessment. Sadly the only course of action was amputation, which was carried out by PDC’s in-house vet, Ishmael. Thembile is recovering at the Rehabilitation Facility now and every effort will be made to get her back to her own pack. Taken from an article written by Peter Blinston in Hoo Calls, Painted Dog Conservation’s newsletter, 14th April 2017. Want to know more about painted dogs and their extraordinary social lifehere.